In July 2018, the International Budget Partnership (IBP) and the Ministry of Finance and Public Credit of Mexico, in collaboration with the United Nations Department of Economic and Social Affairs (UN DESA), co-hosted a side-event during the 2018 United Nations High Level Political Forum, titled Making and Keeping Promises: How are Governments Planning and Spending Towards the SDGs? 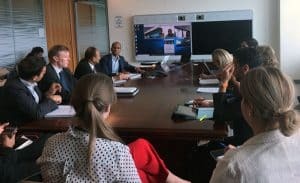 The meeting attracted a broad array of stakeholders, with representation from government, civil society, international organizations, and the private sector coming together to discuss budget credibility, and its relevance to the Sustainable Development Goals (SDGs). Budget credibility describes the ability of governments to accurately and consistently meet their expenditure and revenue targets. At its core, budget credibility is about upholding government commitments and seeks to understand why governments deviate from these commitments. When budgets are not implemented as planned, spending priorities can shift, deficits may exceed projections, and critical services may be compromised. Moreover, governments consistently deviating from their budgets risk an erosion of public trust. This is relevant to the SDGs and specifically recognized by SDG indicator 16.6.1, which assesses whether governments implement their budgets. In recent years, there have been various attempts to measure budget credibility, particularly by the Public Expenditure and Financial Accountability (PEFA) program and the International Monetary Fund’s Fiscal Transparency Code and Fiscal Transparency Evaluations. During the session, Jens Kromann Kristensen, Head of the PEFA Secretariat, described how PEFA measures credibility and monitors SDG 16.6.1 for the UN. The PEFA framework is a methodology for assessing public financial management performance and includes budget credibility (termed “budget reliability” in PEFA) as one of the seven pillars for gauging PFM practices, with three specific indicators that examine deviations in aggregate expenditures and revenues and compositional expenditures. Despite some attention to credibility at the global level by PEFA and others, two key issues pertaining to budget credibility warrant greater attention: the impact of budget deviations on citizens and services, and how governments justify budget deviations and are held accountable for them. Sometimes deviations from the budget are unavoidable. They can be the result of external economic shocks, or even indicative of smart managerial decisions to address unanticipated events. Still, lack of budget credibility has real human costs and can threaten progress toward achieving the SDGs. For example, Atiku Samuel, Head of Research at the BudgIT Foundation, a civil society organization in Nigeria, highlighted the deep underspending in Nigeria’s health budgets. SDG3 calls for reducing infant mortality rates to no more than 12 per 1,000 live births, and under-five mortality to 25 per 1,000 live births by 2030. However, Nigeria’s infant and under-five mortality rates are nearly six and five times higher than these rates, respectively. In recognition of SDG3 and other health challenges, the Federal Ministry of Health allocated over 100 billion naira (USD 277 million) between 2014-2016 to address these problems. But less than half of the allocated funds were actually spent. Health budget deviations have also occurred at the subnational level. In Kaduna State, the state government spent less than half of its health budget from 2014 to 2017. Paul Divakar, General Secretary of the National Campaign for Dalit Human Rights (NCDHR), presented another case of how credibility affects communities. In India, the dalit and adivasi communities, making up about a quarter of the country’s population, have historically suffered deep institutional and societal discrimination as social pariahs. As a result, they are often denied basic human rights and services, even after the government made budgetary commitments to support them. For example, the civil society group Campaign for Adivasi and Dalit Rights to Education (CADRE) uncovered that government scholarships specifically designed to benefit these groups were being denied to eligible dalits and adivasis. A subsequent public hearing organized by CADRE revealed that the Ministry of Social Justice and Empowerment and the Ministry of Tribal Affairs, the two nodal ministries responsible, had failed to transfer about $800 million to state governments for the scholarship programs in just one year alone. Without CADRE’s pressure, the funds set aside in the budget for these scholarships would not have been released. Divakar highlighted how the discrimination dalits and adivasis face in receiving quality education hinders India’s progress towards SDG4, which specifically calls for the elimination of disparities in education among marginalized groups. Stakeholders discussing budget credibility during the 2018 United Nations High Level Political Forum. In light of the knowledge gaps and challenges surrounding budget credibility, IBP has launched the Assessing Budget Credibility (ABC) Project. The project aims to deepen global understanding of the nature of the budget credibility challenge and foster a global community of practice composed of various stakeholders to address budget credibility issues. Governments should be accountable for their decisions to deviate from their original budgets. Without such explanations, civil society and other stakeholders can only speculate on the reasons why governments deviated from their original budgets, which can erode public trust in government. Written explanations, much like published financial data, can allow for a more robust and evidence-based dialogue between governments and citizens. The importance of such explanations is already recognized by global actors like PEFA and the IMF. Some governments have undertaken various initiatives to address the budget credibility problem. For instance, Zia-Ur-Rahman Haleemi, Representative of Afghanistan at The World Bank shared that the Public Works Ministry, the largest spending ministry in Afghanistan, doubled its budget execution rate from about 30 to 65 percent last year through better hiring, internal coordination, and collaboration with donors. Similarly, Natalie Souffront, Head of Economic Studies Department in the Direccion General de Presupuesto in the Dominican Republic, commented that the government has implemented inter-institutional efforts and better planning, allowing the country to climb from the lowest to highest score in PEFA’s credibility assessment. José Francisco Pérez de la Torre, Director of Monitoring, Performance Evaluation Unit at the Ministry of Finance and Public Credit of Mexico, also shared Mexico’s work to improve forecasting and implement a results-based budgetary framework that would more accurately track the nation’s progress towards its goals. Looking ahead, IBP plans to build on this session through additional research on the impact of budget credibility at the country level. We will convene and coordinate a global community of practice to discuss the research findings as they are produced, and work together toward a set of global advocacy objectives. These meetings will enable the group to build a shared understanding of the causes and consequences of lack of budget credibility and develop mitigating strategies. Ultimately, our hope is that the Assessing Budget Credibility project—through its partnerships, products and ideas—will shape collective understanding of and ways to address problems associated with budget deviations.